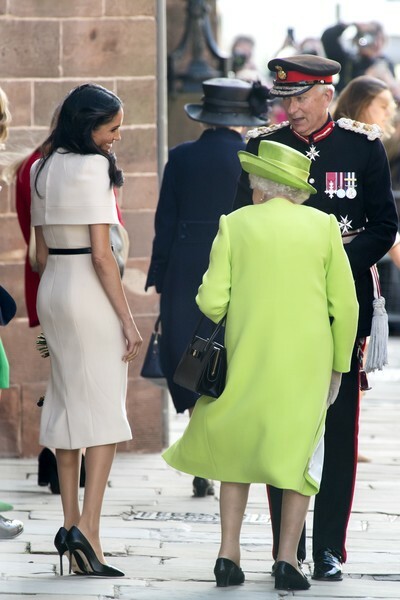 Meghan, Duchess of Sussex and Queen Elizabeth II share a smile as they speak with the Lord Lieutenant as they leave Chester Town Hall on June 14, 2018 in Chester, England. Meghan Markle married Prince Harry last month to become Meghan, Duchess of Sussex. This is her first engagement with the Queen. During the visit the pair opened a road bridge in Widnes, visited The Storyhouse in Chester followed by the Town Hall.